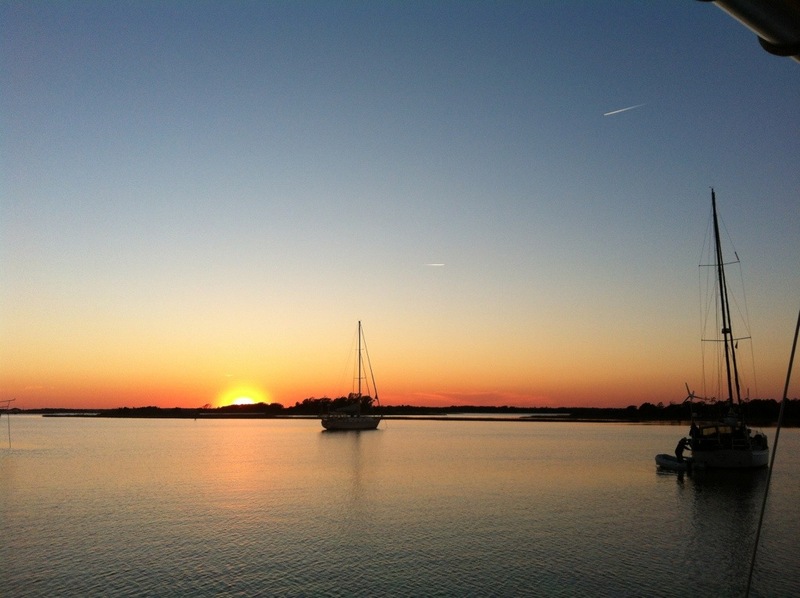 We had every intention of making the 36 hour passage from Beaufort, NC, to Charleston, SC. But when we did our final weather check this morning there was a small craft warning from Beaufort to Surf City with gusty winds and contrary waves, then after the front moved through the wind will die nearly completely. So we were facing 18 hours of sailing in uncomfortable chop, then 18 hours of motoring in confused seas. No thanks. 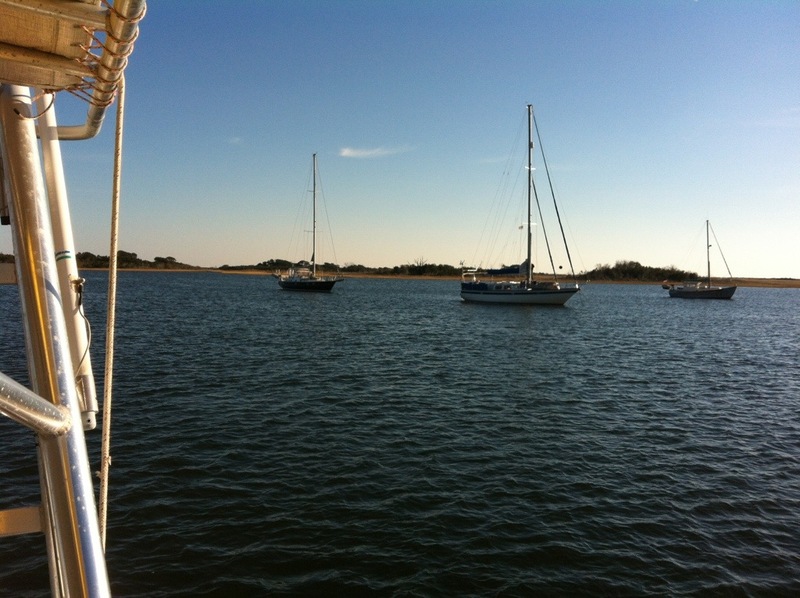 There will be times when we won’t have a choice but to sail in imperfect conditions, but we did have a choice today, and we chose to go the ICW route to Southport where the weather looks good for an outside run to Charleston later in the week. We lined up with all the other boats caught too far north and anxious to get south. Sometimes there were so many boats so close, I took to analyzing what everyone was wearing and rethinking my own cold weather gear. 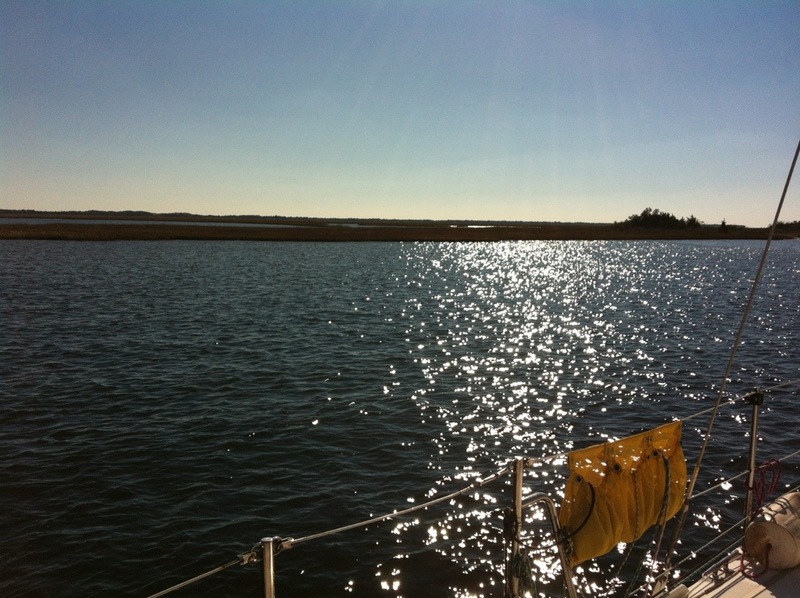 We went aground once in the middle of the channel in Bogue Sound but Jack managed to get us off before too long. Good thing, too, because the wind was blowing us further toward the shoal and I was preparing an anchor to kedge us off, or at least hold us in one place until the tide rose. It was so cold we didn’t want to have to sit and wait for a couple of hours for higher water. Since we know we can’t make the passage to Charleston until at least Wednesday, there’s really no hurry to get to Southport so we planned to anchor tonight at a small dredged basin in the area of Camp Lejeune. So did all the other boats. We’re warming up with hot mulled cider and we’ll have homemade soup and biscuits for dinner and another early night because it’s way too cold to stay up. I imagine it’ll be an early start for everyone.